In this chapter, the authors describe how the study of literature can support personal growth but also how specifically it can encourage personal growth to meet future needs and challenges. Literature allows personal growth to happen incidentally and unconsciously through the pleasurable experience of reading or producing a variety of literary texts. However, personal growth through literature can also be a very focused and conscious activity if we target particular twenty-first century skills in the texts and tasks we choose. Through person-centred and needs-based approaches, literary texts can encourage students to think critically and creatively, be collaborative, solve problems, and employ multiple intelligences. Creation of one’s own literary texts can lead to self-discovery, self-understanding, and self-expression. ATC21S. (2013). What Are 21st-Century Skills? Available at http://atc21s.org/index.php/about/what-are-21st-century-skills/. Boland, E. (2007). Atlantis—A Lost Sonnet. Available at http://poemsoutloud.net/audio/archive/eavan_boland_reads_atlantis/. Clandfield, L. (2011). Teaching Material: Using Literature in the EFL/ESL Classroom. 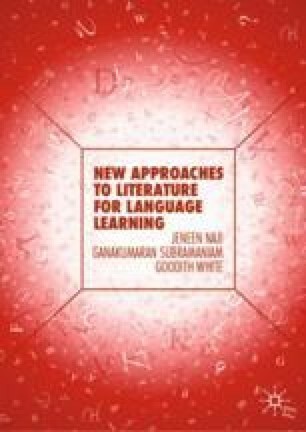 Available at http://www.onestopenglish.com/support/methodology/teaching-materials/teachingmaterials-using-literature-in-the-efl/-eslclassroom/146508.article. Communication and Collaboration. (n.d.). Partnership for 21st Century Skills. Available at http://www.p21.org/index.php?option=com_content%20&task=view&id=261&Itemid=120. Gorrie, E. (2007). It’s Change…. Available at https://spasmicallyperfect.wordpress.com/2007/02/22/science-poem-its-change/. Savvidou, C. (2004). An Integrated Approach to Teaching Literature in the EFL classroom. The Internet TESL Journal, 10(12). Available at http://iteslj.org/Techniques/Savvidou-Literature.html. Thakur, A., & Dave, M. (2016). Paradigms of Communication Skills in English Language and Literature. International Journal of English Language, Literature and Humanities, 4(3), 141–148. Available at http://ijellh.com/wp-content/uploads/2016/04/23.pdf?x72302. Zafeiriadou, N. (2001). Literature in the EFL Classroom. TESOL Greece Newsletter. Available at http://www.tesolgreece.com/nl/71/7104.html. Zafeiriadou, N. (2004). On Literature in the EFL Classroom. Available at http://www.developingteachers.com/articles_tchtraining/lit3_nelly.htm.